After an uneventful night, we woke and broke down our tents. The scouts went and got the bear bags down and brought our smellables back to us. We divided up the troop gear (pots, food, etc. 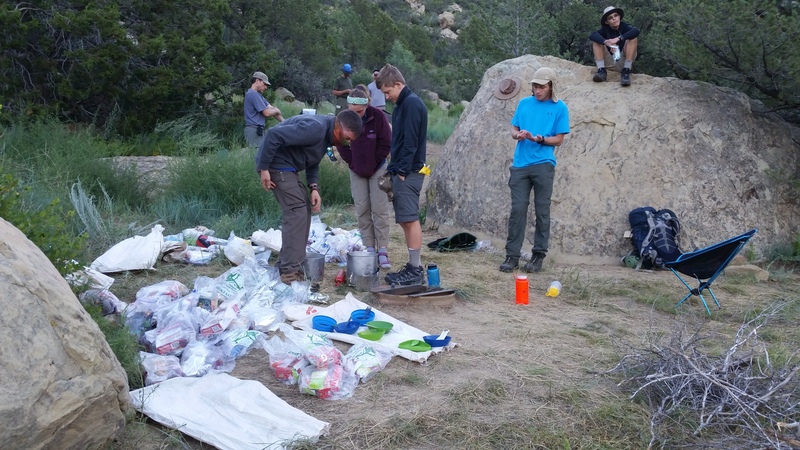 ), grabbed our personal mess kits (bowls, sporks, plates, cups) and packed them in our backpacks. In pairs, we opened our breakfast bags and divided up the contents. Once completed, we brought our backpacks down to the staffed area so that we could do some programs. 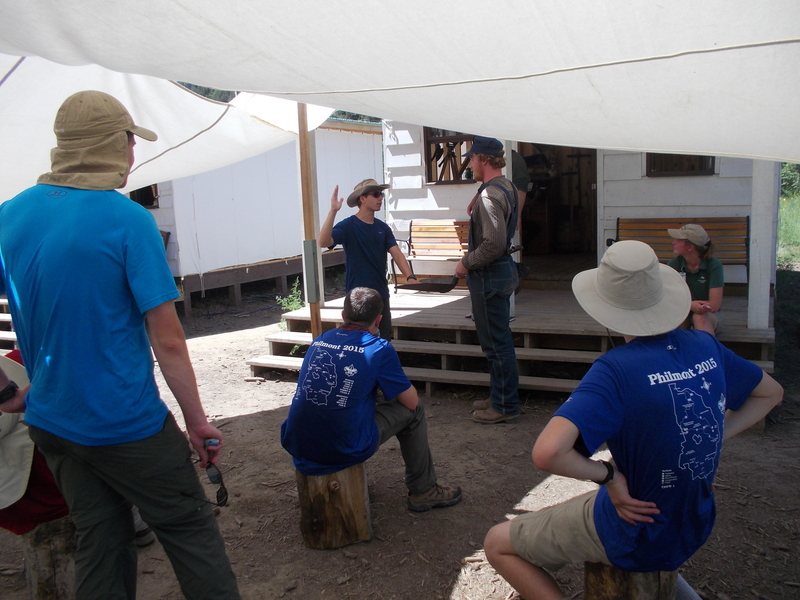 Depending upon which staffed camp you are at, you have different options for what your crew can do. 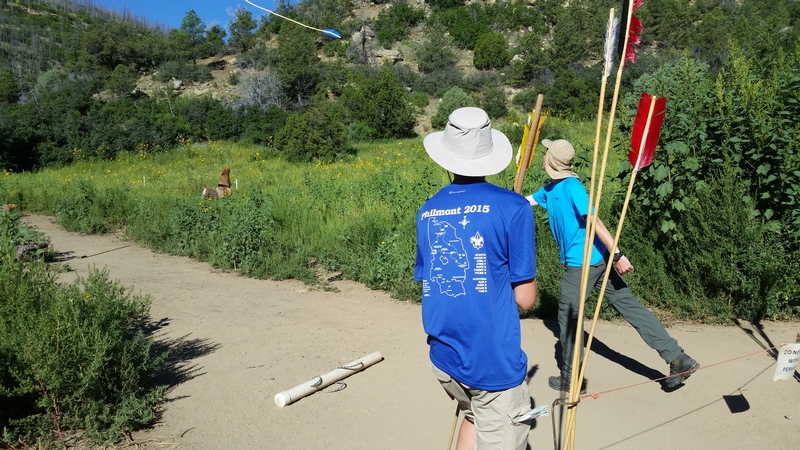 At Indian Writings the scouts (as they made the decisions…us adults were “on vacation”) decided that they preferred to throw Atlatls and not go see some petroglyphs. So, with our backpacks in a pack line, we headed with a staff member to throw 7 foot long darts at targets. I’d heard that sometimes the adults don’t get to do the programs if there isn’t enough time and other crews were waiting to do them. In this case, there was no one else around so we had plenty of time. So we threw and we threw and we threw. It was hard and few of us hit the targets but we did have a good time. With the atlatl darts resting comfortably in their holders and fond farewells to the staff at Indian Writings we hit the trail for the first time that day and started our walk to Metcalf Station. With the heavy rains that this area had been getting for most of the summer, our views were not the typical “this is the desert” ones we expected. 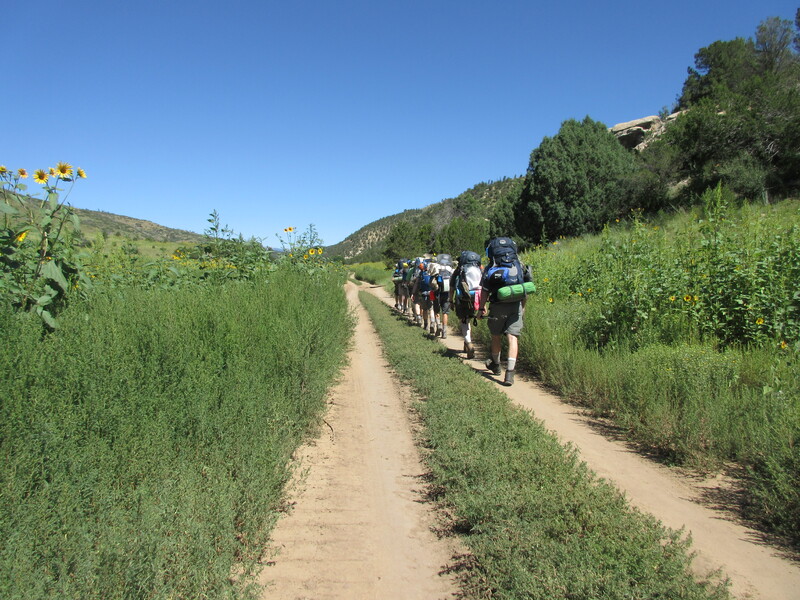 We walked through fields of 8 foot high sunflower plants and fragrant sage brush. The normally dry streams were flowing with ample amounts of water. This was reassuring for me as, in Maryland, I generally don’t worry about where I’m going to refill my water bottles. Didn’t have to really worry about that in New Mexico either as it turned out. 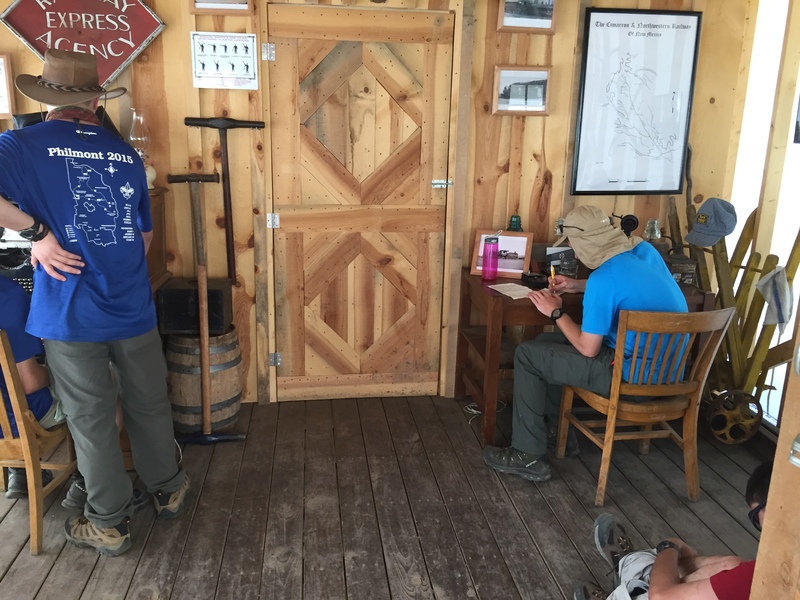 Metcalf station was a welcome respite from the heat. Since most of the morning we walked on a road (see pic above), the sun relentlessly beat down on us. Metcalf not only had very friendly staff, they had shade (see the white awning in the pic). As a staffed camp, it also offered programs from using telegraphs to laying railroad tracks. Yup. They have actually built about 750 feet of railroad and are having the scouts lay more track each day. There is a hand-push railroad car (you’ve seen these in Ye Olde Timey pics of people pushing up and down on a see-saw-like rail in the middle of a flatbed railroad platform) that rides the rails back and forth. The staff were history interpreters and dressed/talked/acted like people that worked on the railroad in the 1880s (I think that was the time period). 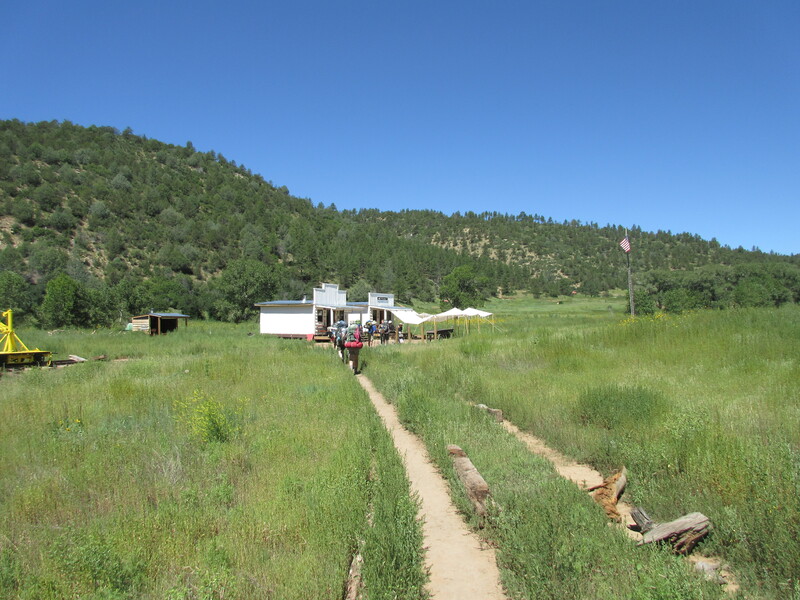 When we arrived at the staffed camps, the staff would, from a distance, yell something at us like “WELLLLLLLLLLLLLCOMMMMMEEEE TO Metcalf Station! !’ Was something that I started looking forward to and missed when it didn’t happen. We put our packs in a pack line and then sat in the shade. One of the staff asked for our crew leader to come up and get sworn in as a railroad worker. They had a funny and entertaining routine they did with the scouts while they explained what programs they had, where the water was and what we could/could not do. Each staffed camp also had a trash can for our trash and a swap box for food we wanted to trade. The great thing about these boxes was that you didn’t have to “trade” you could just put what you didn’t want from your meal bags in there (lightening your load) and you could choose to just take stuff out of the boxes if there were things you liked. FREE FOOD (and drink mixes)!! Sometimes the stuff in there was terrible but every now and then you found some good stuff. Those were good days. The scouts chose to sit and rest in the shade, have lunch and use the telegraphs. 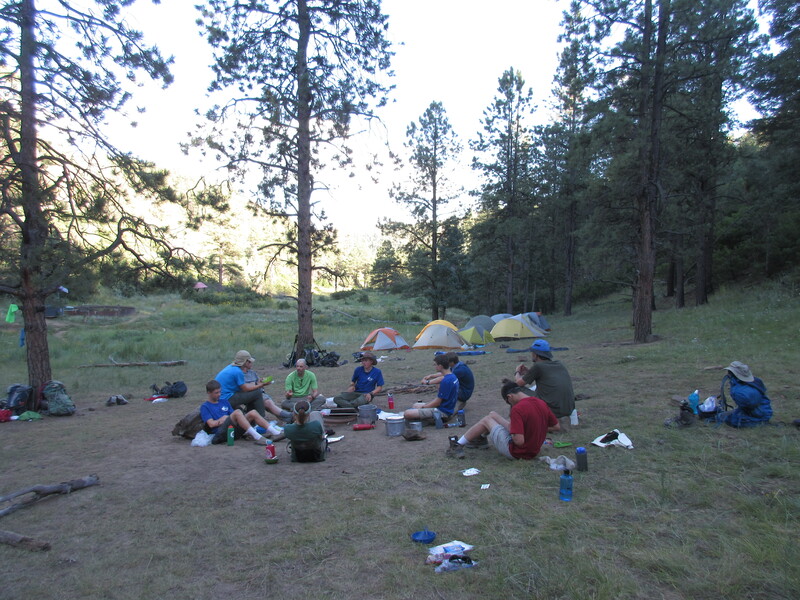 Then we headed on to Cook Canyon our first trail camp (no staff, no luxuries). The heat and sun continued to pummel us for a while until we left the road and took a trail into the woods. The shade was glorious and the stream that we walked next to was a welcome change of scenery as we hiked to our destination. 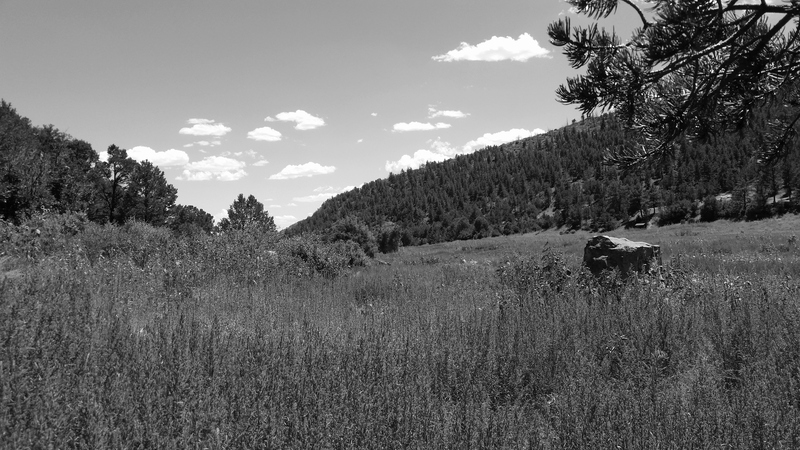 I’ve found that sometimes black and white pictures can capture scenes differently than color pics. So I started taking some of these pics and, throughout the rest of the trip, continued to bring a little more black and white to our trip. 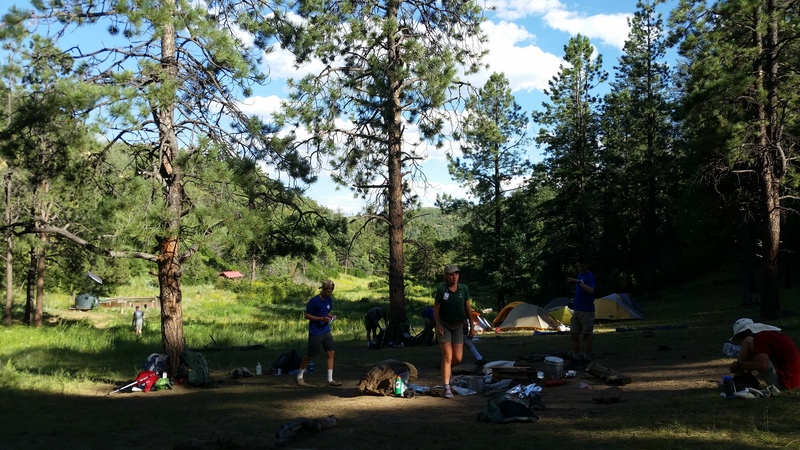 At the trail camps, the scouts get to decide which camp site our crew used. We were told by Anna not to take the first or last one that we saw so that crews getting in later could get those. We picked a HUGE site near the red roof and the water. It was a great spot. In the pic below you can see our tents in the right half of the photo, the red roof off to the left and a round gray container at the far left. the gray vessel had water in it. Rangers only stay with their crews for 3 days and 2 nights. This was the last night we had with Anna. She continued to teach us about emergency procedures through dinner. After our meal, she brought out a pound cake with chocolate frosting on it!!!!!!!!!!!!!! Talk about something to lift our spirits. Anna’s plan was to leave us right after breakfast in the morning. She’d hike back south to Metcalf station by herself. Unfortunately we also had a scout that had been feeling poorly since Indian Writings. Before we left Maryland, eight out of ten of our crew got certified in Wilderness and Remote First Aid (aka, “What do I do when someone gets hurt and there is no 911?”) so we understood many of the common issues that could happen out in the woods. Even though I had been working with the scout, trying to ensure that he drank lots of fluids and rested, his condition continued to worsen. After a brief conference with the other adults, we decided that if the scout did not feel better in the morning, we would need to get him some more in-depth medical care. 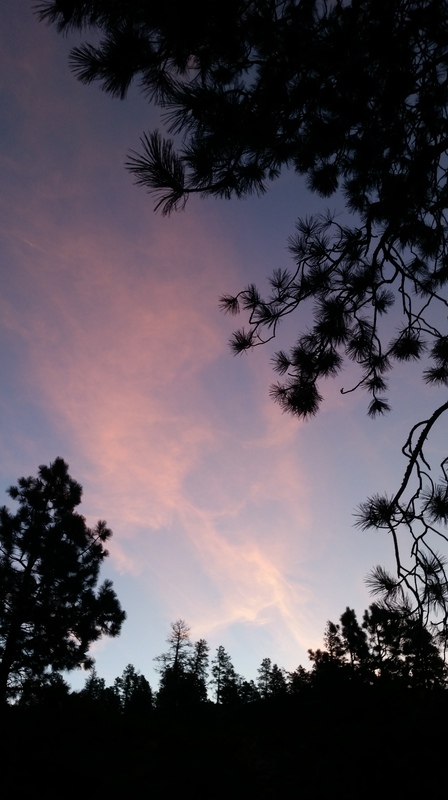 Our Chaplain’s Aide and Gaia scouts talked with us about their respective topics and then, with good thoughts in our heads and bellies full of cake, we went to sleep. This all sounds very cool & interesting, Micah… thanks for sharing, looking forward to the rest! Thanks Jack. It gets better! I was a Boy Scout and attended the National Jamboree at Fort AP Hill in 1997. Made Eagle Scout in 1999. I didn’t make it to Philmont but now I wish I had. I didn’ t go as a boy and was glad I got to go with my son. Thanks for the comment!